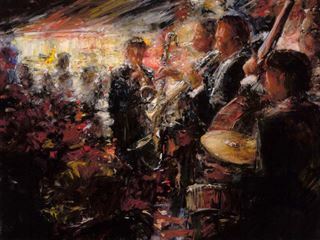 Jazz Club| Painters Chair Fine Art in Coeur d'Alene, Idaho features original paintings, sculpture, prints and much more. I only recently have begun to understand jazz. I guess I hadn't considered how interpretive, expressive, and impressionistic it really is. All of the arts are related, but some are more related than others. Impressionism and jazz are like brothers.